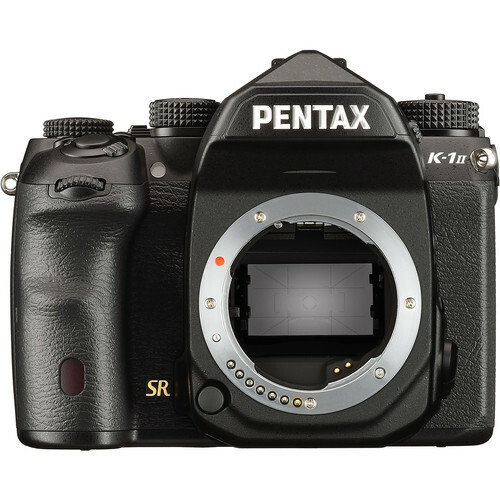 Distinguished by enhanced processing and improved imaging capabilities, the K-1 Mark II from Pentax is the follow-up to their first full-frame flagship DSLR. Revolving around a 36.4MP CMOS sensor and PRIME IV image processor, the camera is capable of producing high-resolution stills at up to 4.4 fps along with recording Full HD video. The 14-bit image processor has been updated with a Ricoh-developed Accelerator Unit, which helps to reduce noise and increase clarity and color accuracy, as well as boost the sensitivity range up to ISO 819200 for working in low-light conditions. Also contributing to improved image quality is the 5-axis Shake Reduction system, which minimizes the appearance of camera shake for sharper handheld shooting. This image stabilization system also enables Pixel Shift Resolution II, which leverages the movement of the sensor to record four sequential frames and merge them together in order to acquire greater color detail and resolution. Dynamic Pixel Shift Resolution also benefits from this technology, however lets you achieve similar results even when working handheld. Box Dimensions (LxWxH) 8.5 x 6.7 x 4.5"
K-1 Mark II DSLR Camera (Body Only) is rated 4.9 out of 5 by 15. Rated 5 out of 5 by Richard from K1 II initial impressions Having now just used the K1 for over 1500 photos, my initial impression is that this camera just does what I ask of it. I have not used many of the auxiliary features yet ( HDR, astrophotography ) but for my landscape photography, it does an excellent job. My first impressions are with the DFA 24-70 lens and this seems to be an excellent combo for everyday use. Although others have noted that battery life is not exceptional, I have yet to recharge it and the battery life still shows as being almost full. In the past, I have been very satisfied with my K3 but since getting the K1 II, this is all I have used, While it is heavier than what I am used to, I have had no issues and use it with the grip for added control. Rated 5 out of 5 by Casey from Excellent The K-1 II does very well in all areas.? Structure, menu design, features, weather resistance, style, AF, detail in images, and overall image quality. I have tested with it shooting still objects, flying birds, sports (lacrosse, track, and softball) and it yields images with excellent color and detail, while the AF does very well with tracking moving subjects or shooting stills. When cropping images I have found that they retain a lot of detail. I am happy that I purchased the camera, and would recommend it. Rated 5 out of 5 by Michael from First Rate Image Quality When I was ready to upgrade from my K3 to a FF high pixel count camera I agonized over whether to get the K1 ii or switch to a much more expensive Nikon or Sony. I am glad I got the K1. It is a huge improvement with significantly better dynamic range, lower noise, better focusing, and superb IQ. For still pictures, I dont think you can do better with any FF camera. A pleasant surprise is all my Pentax lenses work just fine in FF mode: DA 1:2.4 70 mm, DAF Macro 1:2.8 100mm, and DA* 1:4 300mm. Nice! Rated 5 out of 5 by Dave from great camera As any number of professional reviews will tell you, this is a pretty great camera for a a brand that has sadly fell into some level of obscurity. If I had to replace mine, I would buy another without hesitation. Rated 5 out of 5 by Steven from I Love this camera I had been using the Pentax K-1 and really liked it Now I have the PentaxK-1 Mark ll and Love it. It has everything the K-1 has plus faster sharper and all the controls are in the same location. Rated 5 out of 5 by John from Lots of improvements from istD Still testing and adjusting settings. My first few photos are very clean. Having fun once again taking photos. Having to upgrade software to edit the large photos. One item I miss is the quick flash pop up, having to use my big flash mounted on the camera. Over all I am very impressed with the new K-1 Mark II. Even all my older lens works good, and my 135-600 one touch by Pentax in manual mode works. What is its included warranty? Is there a instruction manual included with the camera? Yes just the basic manual. Will the Pentax K1 Mark ii feature a clean hdmi output? What video features have been upgraded? Video has not been updated in the Mark II. It will not have clean HDMI out. I placed my pre order when first announced. Is the April 11th ship date still accurate? I see that Ricoh Japan shows an April 20th date. However, I still see April 11th on all U.S. sites. Heres hoping for the 11th. Has anyone experienced an orange/yellowish skin tone when photographing people? How did you overcome that? We are certain the setting on your camera known as the White Balance is incorrect. Please go to the menus&gt;Setting&gt;White Balance&gt;Auto. Tell me,please, what weight will be Pentax K-1 Mark II with package? Shipping weight - body only fedex 3.6 lbs / 1.63 kgs. I have a Penax SLR camera and thinking of a trade-in, can that be done at your store? They advertise that they take trades and provided a quote for my Pentax 1stD and battery grip, I sent the camera and grip to the NY store and once evaluated, requested a store credit as I planned a new Pentax purchase. Took 2 months and a few e-mails to get an answer as to status, They eventually advised they issued a check to me and of course at a much lower dollar value than originally provided, while ignoring my original preference for a store purchase credit, or my executing the option to return the camera given the significant dollar reduction in the value. I was traveling extensively during those Summer months of 2017. Never saw the check. When I eventually remembered in late Spring of 2018 that I never did receive the check, too much time had passed to resolve.